For other uses, see Louisiana Purchase (disambiguation). The Louisiana Purchase (French: Vente de la Louisiane "Sale of Louisiana") was the acquisition by the United States of America of 828,800 square miles (2,147,000 km2) of France's claim to the territory of Louisiana in 1803. The U.S. paid 60 million francs ($11,250,000) plus cancellation of debts worth 18 million francs ($3,750,000), for a total cost of 15 million dollars for the Louisiana territory. The Louisiana Purchase encompassed all or part of 14 current U.S. states and two Canadian provinces. The land purchased contained all of present-day Arkansas, Missouri, Iowa, Oklahoma, Kansas, Nebraska, parts of Minnesota that were west of the Mississippi River, most of North Dakota, nearly all of South Dakota, northeastern New Mexico, the portions of Montana, Wyoming, and Colorado east of the Continental Divide, and Louisiana west of the Mississippi River, including the city of New Orleans. (The Oklahoma Panhandle, and southwestern portions of Kansas and Louisiana were still claimed by Spain at the time of the Purchase.) In addition, the Purchase contained small portions of land that would eventually become part of the Canadian provinces of Alberta and Saskatchewan. The purchase, which doubled the size of the United States, comprises around 23% of current U.S. territory. The population of European immigrants was estimated to be 76,556 as of the 1810 census. Napoleon Bonaparte, upon completion of the agreement, stated, "This accession of territory affirms forever the power of the United States, and I have given England a maritime rival who sooner or later will humble her pride." The city of New Orleans controlled the Mississippi River through its location; other locations for ports had been tried and had not succeeded. New Orleans was already important for shipping agricultural goods to and from the parts of the United States west of the Appalachian Mountains. Pinckney's Treaty, signed with Spain on October 27, 1795, gave American merchants "right of deposit" in New Orleans, meaning they could use the port to store goods for export. Americans used this right to transport products such as flour, tobacco, pork, bacon, lard, feathers, cider, butter, and cheese. The treaty also recognized American rights to navigate the entire Mississippi River, which had become vital to the growing trade of their western territories. In 1798 Spain revoked this treaty, which greatly upset Americans. In 1801, Spanish Governor Don Juan Manuel De Salcedo took over for Governor Marquess of Casa Calvo, and the right to deposit goods from the United States was fully restored. Napoleon Bonaparte returned Louisiana to French control from Spain in 1800, under the Treaty of San Ildefonso (Louisiana had been a Spanish colony since 1762.) However, the treaty was kept secret, and Louisiana remained under Spanish control until a transfer of power to France on November 30, 1803, just three weeks before the cession to the United States. James Monroe and Robert R. Livingston traveled to Paris to negotiate the purchase in 1803. Their interest was only in the port and its environs; they did not anticipate the much larger transfer of territory that would follow. The original treaty of the Louisiana Purchase. Jefferson initiated the purchase by sending Livingston to Paris in 1801, after discovering the transfer of Louisiana from Spain to France under the Third Treaty of San Ildefonso. Livingston was authorized to purchase New Orleans. In 1802, Pierre Samuel du Pont de Nemours, a French nobleman, began to help negotiate with France at the request of Jefferson. Du Pont was living in the United States at the time and had close ties to Jefferson, as well as to the political powers in France. He engaged in back-channel diplomacy with Napoleon on Jefferson's behalf during a visit to France, and originated the idea of the much larger Louisiana Purchase as a way to defuse potential conflict between the United States and Napoleon over North America. Jefferson disliked the idea of purchasing Louisiana from France as that could imply that France had a right to be in Louisiana. Jefferson believed that a U.S. President did not have the authority to make such a deal: it was not specified in the Constitution. He also thought that to do so would erode states' rights by increasing federal executive power. On the other hand, he was aware of the potential threat that France could be in that region, and was prepared to go to war to prevent a strong French presence there. Meanwhile, Napoleon's foreign minister, Charles Maurice de Talleyrand, vehemently opposed selling Louisiana since that would mean an end to France's secret plans for a North American empire. Throughout this time, Jefferson had up-to-date intelligence on Napoleon's military activities and intentions in North America. Part of his evolving strategy involved giving du Pont some information that was withheld from Livingston. He also gave intentionally conflicting instructions to the two. He next sent Monroe to Paris in 1803. Monroe had been formally expelled from France on his last diplomatic mission, and the choice to send him again conveyed a sense of seriousness. Napoleon was faced with revolution in Saint-Domingue (present-day Republic of Haiti). An expeditionary force under his brother-in-law Charles Leclerc had tried to re-conquer the territory and re-establish slavery. But yellow fever and the fierce resistance of the Haitian Revolution destroyed the French army in what became the only successful slave revolt in history, resulting in the establishment of Haiti, the first independent black state in the New World. Napoleon needed peace with Great Britain to implement the Treaty of San Ildefonso and take possession of Louisiana. Otherwise, Louisiana would be an easy prey for Britain or even for the U.S. But in early 1803, war between France and Britain seemed unavoidable. On March 11, 1803, Napoleon began preparing to invade Britain. Napoleon had failed to re-enslave Haiti; he therefore abandoned his plans to rebuild France's New World empire. Without revenues from sugar colonies in the Caribbean, Louisiana had little value to him. On April 10, 1803 Napoleon told Treasury Minister François de Barbé-Marbois that he was considering selling the whole Louisiana Territory to the U.S. On April 11, 1803, just days before Monroe's arrival, Barbé-Marbois offered Livingston all of Louisiana instead of just New Orleans, at a price of $15 million, equivalent to about $217 million in present day terms. The American representatives were prepared to pay up to $10 million for New Orleans and its environs, but were dumbfounded when the vastly larger territory was offered for $15 million. Jefferson had authorized Livingston only to purchase New Orleans. However, Livingston was certain that the U.S. would accept such a large offer. The Americans thought that Napoleon might withdraw the offer at any time, preventing the United States from acquiring New Orleans. So they agreed and signed the Louisiana Purchase Treaty on April 30, 1803. On July 4, 1803, the treaty reached Washington. The Louisiana Territory was vast, stretching from the Gulf of Mexico in the south to Rupert's Land in the north, and from the Mississippi River in the east to the Rocky Mountains in the west. Acquiring the territory would double the size of the United States at a cost of less than 3 cents per acre. At the Purchase's centennial fair, one illustrator imagined the treaty signing as above. The American purchase of the Louisiana territory was not accomplished without domestic opposition. Jefferson's philosophical consistency was in question because of his strict interpretation of the Constitution. Many people believed he was being hypocritical by doing something he surely would have argued against with Alexander Hamilton. The Federalists strongly opposed the purchase, favoring close relations with Britain over closer ties to Napoleon, believing the purchase to be unconstitutional, and concerned that the U.S. had paid a large sum of money just to declare war on Spain. The United States House of Representatives also opposed the purchase. Majority Leader John Randolph led the opposition. The House called for a vote to deny the request for the purchase, but it failed by two votes 59-57. The Federalists even tried to prove the land belonged to Spain not France, but the papers proved otherwise. The Federalists also feared that the political power of the Atlantic seaboard states would be threatened by the new citizens of the west, bringing about a clash of western farmers with the merchants and bankers of New England. There was concern that an increase in slave holding states created out of the new territory would exacerbate divisions between north and south, as well. A group of Federalists led by Massachusetts Senator Timothy Pickering went so far as to plan a separate northern confederacy, offering Vice President Aaron Burr the presidency of the proposed new country if he persuaded New York to join. Burr's relationship with Alexander Hamilton, who helped bring an end to the nascent northern secession movement, soured during this period. The animosity between the two men ended with Hamilton's death in a duel with Burr in 1804. Issue of 1953, Commemorating 150th Anniversary of signing. Commemorating plaque, inaugurated for the bicentenary of the signing on 20 April 2003, on a wall of the Hôtel Tubeuf in Paris, where the signing took place. On Saturday April 30, 1803, the Louisiana Purchase Treaty was signed by Robert Livingston, James Monroe, and Barbé Marbois in Paris. Jefferson announced the treaty to the American people on July 4. After the signing of the Louisiana Purchase agreement in 1803, Livingston made this famous statement, "We have lived long, but this is the noblest work of our whole lives...From this day the United States take their place among the powers of the first rank." 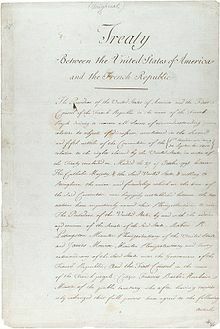 The United States Senate ratified the treaty with a vote of twenty-four to seven on October 20; on the following day, it authorized President Jefferson to take possession of the territory and establish a temporary military government. In legislation enacted on October 31, Congress made temporary provisions for local civil government to continue as it had under French and Spanish rule and authorized the President to use military forces to maintain order. Plans were also set forth for several missions to explore and chart the territory, the most famous being the Lewis and Clark Expedition. France turned New Orleans over on December 20, 1803 at The Cabildo. On March 10, 1804, a formal ceremony was conducted in St. Louis to transfer ownership of the territory from France to the United States. The Purchase was one of several territorial additions to the U.S. The tributaries of the Mississippi were held as the boundaries by the United States. Estimates that did exist as to the extent and composition of the purchase were initially based on the explorations of Robert LaSalle. A dispute immediately arose between Spain and the United States regarding the extent of Louisiana. The territory's boundaries had not been defined in the 1762 Treaty of Fontainebleau that ceded it from France to Spain, nor the 1800 Third Treaty of San Ildefonso ceding it back to France, nor the 1803 Louisiana Purchase agreement ceding it to the United States. The United States claimed Louisiana included the entire western portion of the Mississippi River drainage basin to the crest of the Rocky Mountains and land extending southeast to the Rio Grande. Spain insisted that Louisiana comprised no more than the western bank of the Mississippi River and the cities of New Orleans and St. Louis. The relatively narrow Louisiana of New Spain had been a special province under the jurisdiction of the Captaincy General of Cuba while the vast region to the west was in 1803 still considered part of the Commandancy General of the Provincias Internas. Louisiana had never been considered to be one of New Spain's internal provinces. If the territory included all the tributaries of the Mississippi on its western bank, the northern reaches of the Purchase extended into the equally ill-defined British possession—Rupert's Land of British North America, now part of Canada. The Purchase originally extended just beyond the 50th parallel. However, the territory north of the 49th parallel including the Milk River and Poplar River watersheds was ceded to the UK in exchange for parts of the Red River Basin south of 49th parallel in the Anglo-American Convention of 1818. 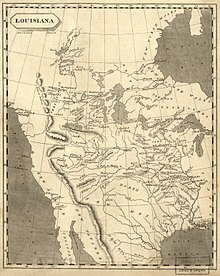 The eastern boundary of the Louisiana purchase was the Mississippi River, from its source to the 31st parallel, although the source of the Mississippi was then unknown. The eastern boundary below the 31st parallel was unclear; the U.S. claimed the land as far as the Perdido River, and Spain claimed the border of its Florida Colony remained the Mississippi river. In early 1804, Congress passed the Mobile Act which recognized West Florida as being part of the United States. The Treaty with Spain of 1819 resolved the issue. Today, the 31st parallel is the northern boundary of the western half of the Florida Panhandle, and the Perdido is the western boundary of Florida. The southern boundary of the Louisiana Purchase (versus New Spain) was initially unclear at the time of purchase; the Neutral Ground Treaty of 1806 created the Sabine Free State during the interim and the Adams-Onís Treaty of 1819 began to lay down official dividing lines. The western boundary was unknown but the Adams-Onis treaty set it as follows: It followed the Sabine River to the 32nd parallel, then ran due north to the Red River, then the Red River to the 100th meridian, which it followed to the Arkansas River, then the Arkansas River to its headwaters, then due north to the 42nd parallel, which it followed to the Pacific Ocean. Plan of Fort Madison, built in 1808 to establish U.S. control over the northern part of the Louisiana Purchase; drawn 1810. After the Lewis and Clark Expedition, the U.S. government sought to establish control of the region, since trade along the Mississippi and Missouri rivers were still dominated by British and French traders and allied Indians, especially the Sauk. Fort Bellefontaine was converted into a U.S. military post near St. Louis in 1804. In 1808 two military forts with trading factories were built, Fort Osage along the Missouri River and Fort Madison along the upper Mississippi River. During the War of 1812 Great Britain and allied Indians defeated U.S. forces in the Upper Mississippi; both Fort Osage and Fort Madison were abandoned, as were several U.S. forts built during the war including Fort Johnson and Fort Shelby. After U.S. ownership of the region was confirmed in the Treaty of Ghent, the U.S. built or expanded forts along the Mississippi and Missouri Rivers, including the expansion of Fort Bellefontaine, and the construction of Fort Armstrong (1816) and Fort Edwards (1816) in Illinois, Fort Crawford (1816) in Prairie du Chien, Fort Snelling (1819) in Minnesota, and Fort Atkinson (1819) in Nebraska. The American government used $3 million in gold as a down payment, and issued bonds for the balance to pay France for the purchase. Because of the impending war with Britain, French banks would not buy or market the American bonds. The American diplomats Livingston and Monroe therefore recommended the firms of Baring and Company of London and Hope and Company of Amsterdam for the transaction which France agreed upon. Because of their reputation as the two most stable financial houses in Europe and because Napoleon wanted to receive his money as quickly as possible, the French treasury minister Barbé-Marbois made arrangements with the two firms to convert the bonds France would receive into cash. After the American bonds had been delivered, the French government then sold them to Baring and Hope at a discount. The original sales document of the Louisiana Purchase was exhibited in the entrance hall of Baring's London offices until the bank's collapse in 1995 and is now in the custody of ING Group, which purchased Barings. The original sales document of the Louisiana Purchase was acquired in 1996 by Walter Scott Jr. in Omaha, NE and now is currently in his private collection. We strive to provide accurate information, however, Louisiana.cc is not an official source of information for any court or court clerk or state office. Information and links on this site are believed to be accurate at time of building this site but may not be accurate as changes do happen. You may in some cases have to do your own search on another website to get the correct information. No legal advice is offered here and this site is not an alternative to competent legal counsel.